Carlos Rodon threw six scoreless innings and Jerry Sands launched his first homer as a member of the White Sox to give the South Siders a 3-0 victory over the Twins at Target Field. It was the White Sox second win in this three-game set, their fifth road win in six games and their third straight victory. "You get thrown in there for four [at-bats], you can relax and see some pitches," said Sands of his success and the team's success in this spot start. "The first [at-bat] didn't turn out, but I ran into one and helped us get a win." The Twins, meanwhile, dropped to 0-8 to start the season. They became the fourth AL team in the Divisional Era (since 1969) to open a season with eight straight losses, per MLB Network. The other three teams eventually lost 100 games: the 1988 Orioles (107 losses), the 2002 Tigers (106) and the 2003 Tigers (119). Rodon allowed three hits over his 107 pitches, but also walked five (one intentional) to give the Twins a few opportunities. But he struck out six and got some needed insurance in the seventh when Sands blasted a 1-2 pitch from Phil Hughes for a two-run shot to center, scoring Brett Lawrie in front of him. Hughes yielded three runs on seven hits in 6 1/3 innings, striking out seven and not issuing a walk. "He's strong. 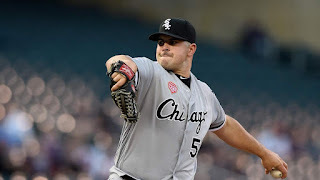 He gets stronger as he goes along," said White Sox manager Robin Ventura of Rodon. "His strength and endurance is something that is going to be a calling card for him because he can continue on. Right there he's throwing too many pitches but as the game's going along you see him getting stronger." Escape act: Minnesota put the first two runners on base in the sixth courtesy of a walk by Rodon issued to Miguel Sano and Trevor Plouffe's single to right. The Twins elected to bunt with Eddie Rosario, meaning the White Sox could intentionally walk Eduardo Escobar, one of the Twins' hottest hitters. With the bases loaded and one out, Rodon struck out Max Kepler on three pitches and retired Kurt Suzuki on a routine foul popout to third basemanTodd Frazier. "Bases loaded, you've got to get ahead," said Rodon, referring specifically to the Kepler at-bat. "To go after him left on left, that's the matchup we wanted. I didn't really want to walk Escobar, but the skip's the skip for a reason, right? That's all right. We got out of it, left on left matchup. Fastball, fastball, slider, and it worked out." Also shutting the door: Chicago had runners at second and third with no outs following Lawrie's double in the fifth. Hughes then struck out Sands and Alex Avila back-to-back, and got out of the inning when Austin Jackson grounded out to third. Lawrie lights it up: Lawrie, who entered the game 8-for-31 against Hughes, flew out deep to right to end the second, doubled in the fifth and singled before Sands' homer in the seventh. The White Sox are off to their first 6-2 start since 2005. Their 5-1 road mark represents their best start away from home since going 6-0 in 1991. Left-handed hitters are now 28-for-150 lifetime against Rodon, with no homers and 12 RBIs. Rodon has a 4-3 record in his last nine road starts, with a 1.49 ERA during that stretch. White Sox: Mat Latos closes out this three-game American League Central matchup in Thursday's 12:10 p.m. CT start at Target Field. The right-hander bounced back from a rough spring by allowing one hit over six scoreless innings during his regular season debut in Oakland. Twins: Ervin Santana will try for his first decision when he makes his third start of the season in the series finale at 12:10 p.m. CT on Thursday, going for the sweep. Santana had his first start cut short because of a rain delay in the opener at Baltimore before going six innings with two runs allowed at Kansas City last week.